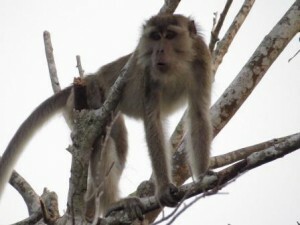 Pleihari Tanah Laut Wildlife Reserve comprises an area of 6,000 hectares in South Kalimantan province. Around 90% of the area is relatively flat and swampy. The remaining 10% is hilly with Gunung Tunggal as the highest peak (102m). The flat area consists of mangrove forest and freshwater swamp including swampy grasslands and swampy forest. Sandy beaches along the coast provide nesting sites for sea-turtles. This wildlife reserve is home to many species of bird such as variety of kingfishers, egrets, shorebirds, doves, and others. The area is also rich in mammals including clouded leopards, banded linsang, proboscis monkeys, long tail macaques, silvery langurs, wild boars, sambar and barking deers, and others mammals. It is supplemented by reptiles include the estuarine crocodiles, varanus monitor lizards, green and hawksbill turtles.